Sandy Grande is an Associate professor and Chair of the Education Department at Connecticut College. Her research and teaching are profoundly inter- and cross-disciplinary, interfacing critical Indigenous theories with the concerns of education. 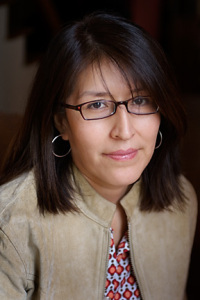 Her book, Red Pedagogy: Native American Social and Political Thought (Rowman and Littlefield, 2004) is currently being published in a 10th anniversary edition. She has also published several book chapters and articles including: “Accumulation of the Primitive: The Limits of Liberalism and the Politics of Occupy Wall Street,” The Journal of Settler Colonial Studies. ”Confessions of a Fulltime Indian,” The Journal of Curriculum and Pedagogy, “American Indian Geographies of Identity and Power: At the Crossroads of Indigena and Mestizaje,” Harvard Educational Review; and, “Red-ding the Word and the World” In, Paulo Freire’s Intellectual Roots: Toward Historicity in Praxis. Bloomsbury Academic. New York, New York. Eds. Robert Lake & T. Kress. (2013).